← Is it time for Jains to give leather the boot? Today is the 90th birthday of one of the two Jain monks that brought Jainism to America. Gurudev has been instrumental in creating the environment that enabled Jains from India, such as my parents, their children born in the US, such as me, and Americans interested in Jainism, such as friends at the Jain Meditation International and Lighthouse Centers, to understand and practice this ancient tradition with its timeless principle of ahimsa. He is pictured on the far right at one of the Pratishtas ( temple openings) that he attended. Gurudev Chitrabhanu came to the US in 1971. I was one year old. As he travelled and authored books, founded Jain Meditation International and spoke to audiences, my parents and their friends founded the Jain Society of Chicago. 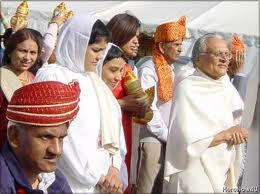 He helped organize the association of Jain associations called JAINA. He wrote books prolifically, and my mother bought them, kept them in our temple and as she prayed, I read them voraciously. I grew up reading “Inspiring Anecdotes”, ” A Lotus Blooms” and later, his books about Jain meditation. I heard Gurudev speak at Jain centers and JAINA conferences. And then when I was 20, I went to Siddhachalam, the Jain ashram founded by Acharya Sushilmuniji, the other Jain monk that brought Jainism to America. I became vegan after attending a New Jersey Animal Rights Alliance Conference there. As I, along with a cohort of Jains in my generation, went vegan, we were reassured that Gurudev and Pramodaben understood and promoted veganism, or pure vegetarianism to our Jain community. They have spoken about the need to remove dairy products from our rituals and our diets, eloquently and persistently. There has been a remarkable resistance to giving up dairy. Some Jains argue that veganism is a religion separate from Jainism and that Mahavir was not vegan. Despite criticism, Gurudev, with the spiritual understanding borne of 5 years of silence with monks’ vows and a lifetime of practice, maintains the clarity of his message: Ahimsa Paramo Dharma. Non-violence is the supreme religion. Veganism is but one expression. One cannot consume milk and consider oneself a pure vegetarian, practicing ahimsa. May I bide in patience. This entry was posted in Jain Philosophy, Uncategorized. Bookmark the permalink.